I’ve considered the question of Vancouver housing prices for some years, and will venture a conclusion. Housing prices are lower and declining around the urban perimeter, for example in Mission or Squamish, because fewer people want to live there. Does this seem too simple? The City, with roughly 20 per cent of the population of Fraseropolis and the near coast, offers transit, walkable urban villages, entertainments, and — especially — career-track jobs in the private sector. 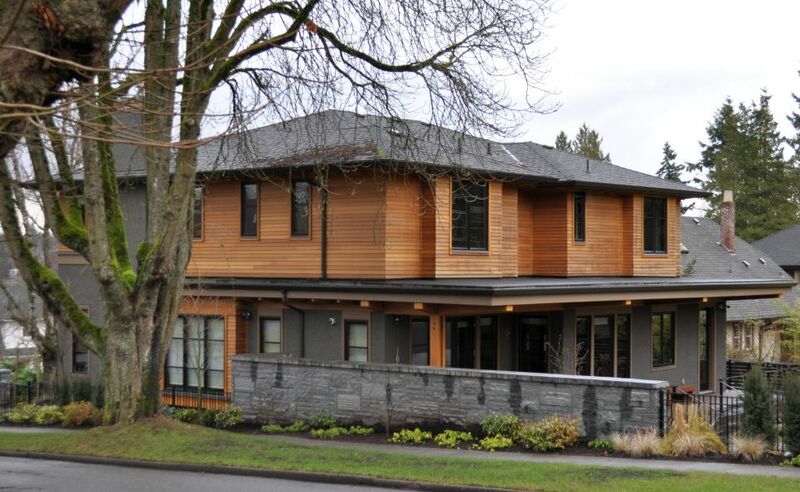 The latest figures from the Greater Vancouver Real Estate Board show a continued rise in detached home prices in the highest-priced areas — in Vancouver, and in the adjacent cities of Richmond and Burnaby, which also have complex private-sector economies. Detached home prices in the mid suburbs such as Coquitlam are flat over the past five years. Prices at the urban margins and beyond are generally down, even though purchase prices are superficially atttractive. Why is this? One obvious answer is that people are increasingly resistant to commuting long distances and paying high transportation costs. The average North American is driving fewer kilometres per day than before, reversing a long-term trend. The post-war “driving boom” is over. At least for now. There are other factors too, perhaps related to transportation costs. Peripheral cities such as Maple Ridge lack management jobs and creative jobs, and they lack excitement. Upwardly-mobile workers move out. The pattern is more stark when we look at apartment prices. Of the 40-odd arbitrary real estate zones defined by the Greater Vancouver and Fraser Valley real estate boards, only City of Vancouver West, City of Vancouver East and Burnaby South show a nominal price improvement over five years. Whistler apartment prices are down 41%, admittedly due in part to a 2010 Olympic bubble. 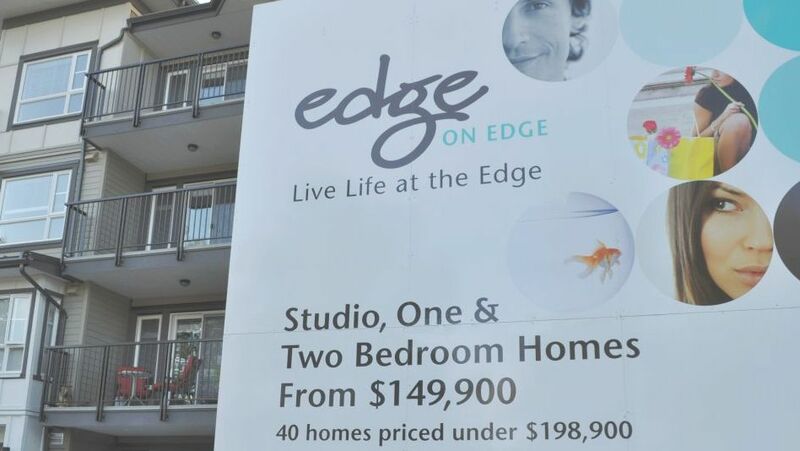 Maple Ridge apartment prices are down 21.5%, and we did not have an Olympics. Not that I heard. Representative charts for June 2013 are shown below. Region-wide, selling prices for detached homes in the Greater Vancouver real estate area (including Howe Sound and the Sunshine Coast) have gone up by 15% over five years, compared with 6% in the Fraser Valley area (including Surrey). With regard to townhomes, the “Greater Vancouver” set shows a marginal gain of 2%, while the “Fraser Valley” area has dropped 6% over five years. The South Surrey/White Rock zone is a standout among the outer suburbs in both the detached home and townhome markets, for reasons of prestige and climate. North Surrey, just up the road, lacks prestige and elite services, although the transportation connections are good and the local government is working hard to create a new civic and cultural zone. The apartment market is weak across the board, with a 2% drop across the Greater Vancouver zone (again, this definition includes some geographical outliers) and a 10% drop in the Fraser Valley. The decline in apartment values is especially bad at the edges, but it creeps close to the urban core to Burnaby East, and South Surrey/White Rock shares in the general negative trend. The latest federal government figures show continued new multi-family construction in those Greater Vancouver areas where prices are rising, and also in less promising areas such as Surrey and Port Coquitlam. New detached home construction has increased in 2013 compared with 2012, and is steady in the Fraser Valley. I thought that you might find the overlap in this latest Times letter interesting. Thanks. BTW, nice work with this site. I’d like to take a longer stroll some time soon. All material I am keenly interested in. Thanks, Craig. The writer of the letter to the Times attributes the weakness of real estate prices in Maple Ridge to overbuilding. At the same time, the letter-writer complains that residential taxes are high because of a lack of commercial and residential development. We could consider these comments in a number of ways. First, I think it would be uncontroversial to suggest that detached home and townhome prices overshot in Maple Ridge in 2006 and 2007 (that is, before the world financial crash) because of a general and undifferentiated faith in the Metro Vancouver market. (This, in turn, was partly related to the hype around the then-upcoming Winter Olympics.) People bought, people built, and perhaps we ended up with too many houses. Second, property taxes in Maple Ridge are not out of line with those in other municipal jurisdictions in Greater Vancouver. I personally believe we get value for our tax payments; try to imagine what you would pay for police protection, fire protection, streets and lighting, bylaw enforcement and planning controls on a libertarian-contract basis. Nonetheless, we are out of line in terms of the relative tax burden on residential property. Commercial employers don’t usually locate in Maple Ridge, with rare exceptions. This is partly locational; that is, we are the Sicily or the Newfoundland of the Greater Vancouver region, and all other things being equal, businesses will tend locate closer to centres of population. I also think our existing business scene is dominated by a small number of players (i.e. many of them were born here) who see no sense of urgency around facilitating change. And we have a lot of NIMBYism, with resident opposition to posted live-work use, village commercial use and especially industrial use. I frankly don’t know where people think where the jobs are supposed to come from; as a result, you work in Burnaby, which is close to an hour away, and I work an hour and twenty minutes from my home in downtown Vancouver. My advice to our local government would be to focus on attracting private investment. In my view, this would require liberalizing the rules around land use — for example, allowing home businesses to put out their shingle, and allowing a wider range of commercial uses in the business park. We should also continue to upgrade the central core, which is the first thing most people see when they come to Maple Ridge, and which is only making tentative steps to shed its longtime status as a national-class eyesore. I would guess that you will disagree with all of this. In any case, as the letter writer points out, the community can’t move in any direction if the local government lacks credibility. And this, for me, will require a lot more than simply kicking out the incumbent council in favour of a pack of angry newcomers. Maple Ridge has been down that road before, and more than once. I have to agree with most of what you are saying here, particularly your assessment of the direction that we should be heading to promote private enterprise. I could not agree with you more about the inherent risk of replacing incumbents with an aptly described “angry pack of newcomers.” The latest scandal has no doubt been a touch point for many individuals harboring some form of resentment towards the incumbents, and, while everyone is touting democracy and transparency, it is hard to look past elements of the mob mentality. What we need are people who are rooted in the community; who are intimately acquainted with the issues; who are engaging the leadership, cooperatively and collaboratively– and there are individuals like that, like Jackie Chow, for instance, though I do not know whether she is contemplating running, nor whether she holds broad enough appeal. I am offering you a personal tour/ visit of Albion where we can move from one project to the next, and I can demonstrate to you first hand where fast paced, rubber stamped, unchecked development is contributing to the problem of slumping house prices. Ironically, many of these more recent additions are sitting empty. While, perhaps, my assessment of progress downtown is perhaps a little rosier than yours, my true concern lies with the general neglect and diffuse planning of the suburbs, the areas I am most acquainted with. If you take me up on my offer, perhaps we will discover that we have a lot more in common in our interests and points of view. I’d be pleased to join you on a tour, Craig. Looks like it will have to be in the fall. Cycle around Albion with a stop for coffee.